Printouts from the instructors Ready Shows (PowerPoint Presentation) or Ready Slides (Acetates printed from the PowerPoint Slides). These are reproduced to help students take notes in class and follow the instructor if the instructor will use the Ready Shows or Ready Slides to guide their in class lecture. 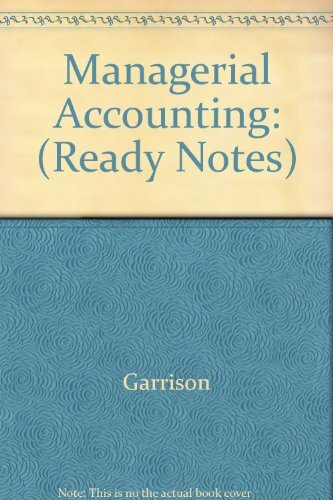 Ray H. Garrison is emeritus Professor of Accounting at Brigham Young University, Provo, Utah. He received his B.S. and M.S. degrees from Brigham Young University and his D.B.A. degree from Indiana University. As a certified public accountant, Professor Garrison has been involved in management consulting work with both national and regional accounting firms. He has published articles in The Accounting Review, Management Accounting, and other professional journals. Innovation in the classroom has earned Professor Garrison the Karl G. Maeser Distinguished Teaching Award from Brigham Young University.